Over these many years of clinical practice, and even more years of working to optimize my own health, I have come to know a certain truth about the human body: sustain, support, and nourish – with lifestyle choices – the energy-producing mechanisms of the body steadily throughout each day. Yes, the needs of the human body happen to be countless; thus we are encouraged to take fish oil, exercise, eat enough protein, limit our carbohydrates, sleep enough and on a regular schedule, cleanse the colon, optimize our intake of vitamins A, B, C, D, and E and our intake of the minerals zinc, copper, magnesium, calcium, potassium, and sodium, drink an ounce of water for each pound of body weight, and so forth. Yet this one need – sustain, support, nourish – with lifestyle choices – the energy-producing mechanisms of the body steadily throughout each day – reigns supreme. 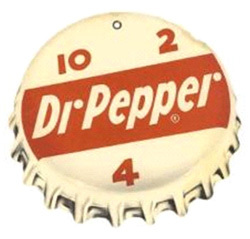 The marketers at Dr. Pepper/Seven Up, a successful soft drink company founded in the late 1800s, capitalized on this scientifically established fact of our biological nature, as we see in their popular and long-lasting slogan to promote one of their products, Dr. Pepper, the first carbonated soft drink, during the 1920s and 1930s: "Drink a Bite to Eat at 10, 2, and 4 o’clock". As the story goes, a Dr. Walter Eddy of Columbia University was studying the human body and metabolism, which led him to discover that a natural drop in energy occurs for each and every one of us at about 10:30 a.m., 2:30 p.m. and 4:30 p.m. He also discovered that if the people in his research study had something to eat or drink at 10:00, 2:00, and 4:00, the energy slump could be avoided. Unfortunately, after Dr. Eddy’s research findings were released, the Dr. Pepper Company commandeered this information for its own advertising campaign – a theme suggesting that Dr. Pepper should be that “10, 2, and 4 o’clock” drink which would keep the blood sugar level up. If the Optimal Health Network were around then, we would not have suggested a sugary soda but rather that you eat a small meal at those times, rich with each of the macronutrients – carbohydrate, protein, and fat. We would have also suggested that you supplement your diet with herbs such as licorice root and/or Rehmannia to optimize your adrenal health. When promotions for Dr. Pepper announced that on Saturdays, the local movie theater would interrupt the film at 10 a.m., 2 p.m., and 4 p.m. to serve complimentary bottles of Dr. Pepper, advertisers were acting on an important truth of human biology – we function best when we keep our blood sugar stable and consistently live our lives such that our adrenal glands don’t unnecessarily release the stress hormone cortisol. It may also be of interest to my readers that this slogan, intended to encourage boosting your blood sugar level at 10 a.m., 2 p.m., and 4 p.m., over the years saw its meaning become muddled, leading thousands of mothers and grandmothers in the South to believe, to this day, that the drinking times are meant to help one achieve bowel regularity.